On October 14th, during our Teacher In-Service, the Rothschild Multipurpose Room was filled with elementary school teachers who were laser-focused on the importance of a well-structured and informed foundation for our students. 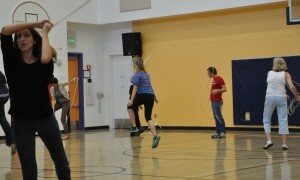 One of the trainings for the day was for our physical education program. 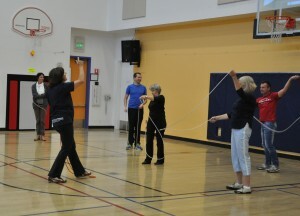 Like any subject, physical education should follow a progression and be individualized. Our goal was to spend time on building and enhancing a progressive, nursery through 5th grade physical education curriculum. This idea of progression applies to our newest P.E. addition, rhythmic gymnastics. Originally, we thought the training would be spent with an expert from France, talking over theory and methods. Unfortunately, the plans fell through at the last minute. Luckily for us, we happened to already have an expert in our midst! Did you know that Patricia Colin, Director of Advancement, is also a well-trained, experienced, and certified Physical Education teacher? I have worked with Patricia for approximately 15 years. Not only am I fortunate enough to call her my colleague, but also, I am honored in that we’ve shared a long-time friendship. I already knew she had an impressive background as an athlete and teacher, so I expected the training to be very rich and informative. What was also not surprising was that Patricia imbued the training with the same generosity she shares in our friendship: honesty, encouragement, and great knowledge. What Patricia, and every great teacher, knows is that teaching is not just about talking to a classroom of students and hoping that they memorize and remember everything you tell them. Teachers know that a great deal of learning happens through doing. We were shown how to build a program into something that is appropriate and specific to the abilities of each age group and, equally important, each individual. During the lesson, we learned that the cultivation of motor skill is involved in many aspects of a child’s development. For example, manipulating a simple object, such as a rope or a hoop, in levels of increasing difficulty, can help children learn vocabulary and build the motor function skills necessary in writing. 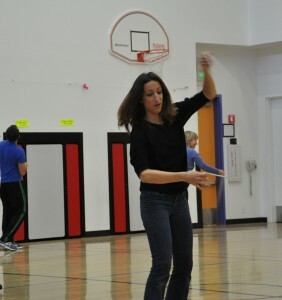 It was definitely “back to basics” as Patricia led us through a PE class, guiding us in how to do the movements ourselves, as well as what to expect from our students. We focused on the capabilities of children at their developmental stages and how to appropriately lead them through these activities. Teachers, just like everyone else, are human. And honestly, many of us feared being called out to demonstrate what we were just taught. This was a good reminder to us that our students also face their own similar fears in our classrooms! However, just as we strive to make our classrooms a comfortable environment for our students to experiment and be themselves, the training also turned out to be a comfortable environment for us as teachers. We were allowed to choose when to show our skills, or perhaps lack thereof, as well as when to differentiate our varying abilities and talents. In a mixture of praise and playful critique, Patricia imparted new knowledge onto the team of French elementary school teachers, and the experience helped us reflect on what it is like to be a student in a classroom. As some of us learned new things, like jumping rope or proper body alignment, we may have challenged the possibility of small children being able to move in ways we couldn’t. We were reminded that these little students are more flexible and resilient than we might think. As was done for us, we should remember to offer appropriate challenges to our students that allow for development, always catering to varying levels of skill or talent. At ISTP, we’re fortunate that we have professional development opportunities and wonderful internal resources – such as the experience and skills provided by Patricia. I, as well as the other French elementary teachers, look forward to incorporating what we learned at the training into our classrooms. As always, our students are our first priority, and continuing to enhance, build, and revamp our curriculum and activities to fit the growing needs of our students is of utmost importance.